This website reports the results of the Danish buried valley mapping project. The project was initiated by the Danish counties in 1998 with the purpose of mapping and describing the buried valleys in the Danish subsurface. Buried valleys plays an important role for the administration of the groundwater resources, because a large part of the Danish water supply is based on buried valley aquifers, but also because the valleys sometimes act as pathways for contaminants from the surface to deeper aquifers. The buried valleys are also found to have a large influence on the groundwater flow paths, and a thorough understanding of the occurrence and architecture is therefore necessary, especially regarding the relation between aquifers, groundwater flow and groundwater vulnerability. The buried valleys are primarily formed as tunnel valleys by high-pressure meltwater underneath the glaciers during the ice-ages. Buried valleys appear both as single valleys and in dense networks. The internal structure of the valleys is typically complex due to repeated erosional and depositional events. Buried valleys are common geological structures in the region and they have a high influence on the distribution of Tertiary and Quaternary sediments. The mapping project has been financed by the Danish Nature Agency. 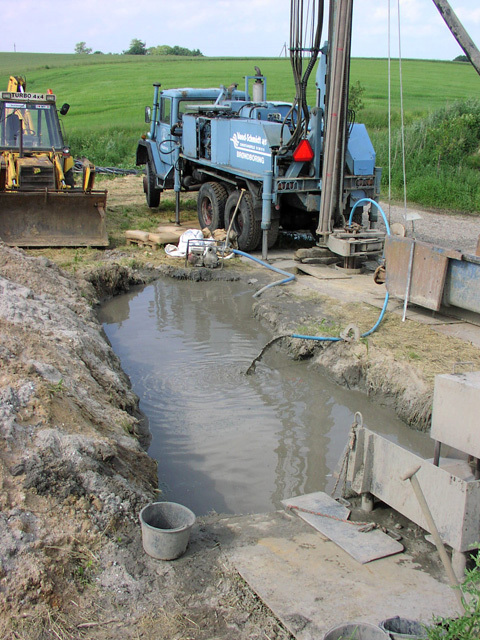 GEUS is responsible for the geological interpretations in the project and in certain instances these can be different from the interpretations made in the National Groundwater Mapping Project performed by/for the Danish Nature Agency. Likewise, recommendations put forward by GEUS in the buried valley reports are not necessarily supported by the Nature Agency. The mapping has since 1998 been performed by Peter B. E. Sandersen and Flemming Jørgensen. During the update of the 2015-report valuable work on the descriptions of localities has been performed by Anne-Sophie Høyer and Anders Juhl Kallesøe. Generally the information on this homepage is in Danish - including the project reports, but on the Download page you will find references to papers in english based on the results of the project so far.